Hand planes in olden times were indispensable woodworking tools. They were always on hand to shape, smooth, and straighten any piece of wood in your home or workshop. Carpenters would haul an entire tool chest of specialty planes. Nowadays power tools like belt sanders, power planers, jointers, and belt sanders perform manual planning tasks much, much faster, which banishes the old hand planes to dusty antique shops (Source). While there aren't as many types as there once were, the hand plane is far from extinct, however. Because it can pare off just a thin slice of wood, no tool is better for shaving the edge of a sticking door, chamfering the corner of a board, or straightening one that is twisted or warped (Source). That's why most carpenters still pack a hand planer or two in their toolboxes. Our top pick is the Kanna Japanese hand plane- buyers say that it offers unbeatable quality for the price. It does pay to watch a set up video (like the one below) to start. Reviewers say that you almost feel 'at one' with the wood- the tool blending seamlessly into your consciousness creating tissue-paper thin shaves. Some reviewers even say they enjoy planing just for planing's sake! Hand planes have been around nearly as long as humans have been working with wood. It's essential for shaping or flattening wood surfaces. Hand planes consist of a cutting edge that’s set within a wood or metal body (Source). Hand planes work by the force of pushing the tool across the wood or material you want to flatten or shape. They can be operated with one hand, while the larger bench models require two-handed operation (Source). Buyers say that a good hand plane can be bought new pretty cheap, but also advise hitting up those antique shops and thrift shops for vintage tools as well. For this piece, we looked at 5 hand planes, both the small one-handed variety and the two-handed bench planes. While these are all budget, entry-level options, they’re perfect for the beginner and should be a good introduction into the world of hand powered tools. 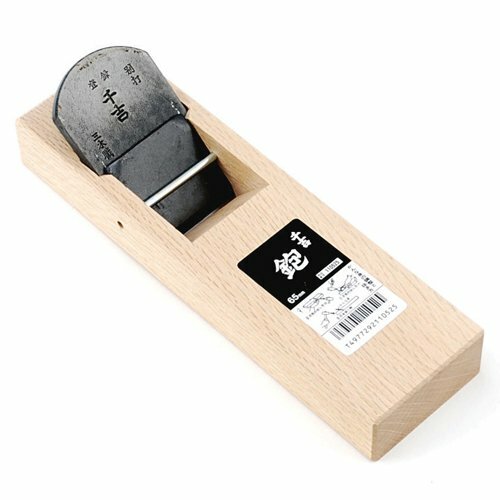 The Senkichi Kanna 65mm Japanese Wood Plane is very sharp and can make very thin shavings. Users noted that, while it’s a high quality product, it does take a fair amount of time to properly set up, which is common among budget options. If you can get past the initial set up curve, this is a great tool for the beginner woodworker. The Stanley 12-220 Block Plane is a manually adjustable tool ideal for general purpose use and light duty home and craft jobs. The cutter sits at a 21˚ angle and works for cross-grain planing. Buyers said that while the blade came sharp from the manufacturer, some found that it chipped easily when using on harder woods like pine. Still, a good beginner plane for the price. 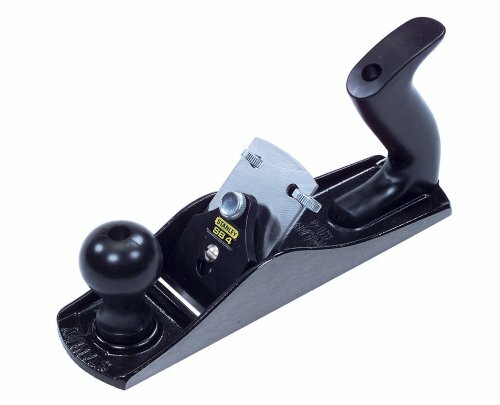 The GreatNeck C4 Bench Jack 9 inch plane is listed as a professional-quality tool designed for heavy duty woodworking. Comes with adjustable blades for fine or coarse work, which makes this one of the more versatile planes we looked at. The solid wood handle provides great control and stability and is comfortable to use for long periods of time. Users say this blade arrived sharp out of the box, but like most planes, it does need “setting up” before you can get good results. The Grizzly H7566 14-inch Smoothing Plane is perfect for finishing work and making adjustments is smooth and easy. As a budget option, this one performs remarkably well and users compliment how flat the sole is for a tool in this price range. The Stanley 12-404 No. 4 Adjustable Bench Plane with 2-inch cutter features tempered steel for durability and precision. The polymer handle is decent, but many users prefer wood for its comfort over long periods of use. Like most budget options, this one also requires quite a bit of set up to get it in proper order, but once it’s set, it’s a remarkable tool for the price and will hold you over until you’re ready to step up to more advanced tools. The Stanley Adjustable Bench Plane is a solid option if you are looking for a hand plane which gives you a great grip that permits true accuracy and long use without fatigue. Users like the functionality of this hand tool, but some do complain about several design drawbacks. This product is a 9-3/4-inch adjustable bench plane with a 2-inch cutter. It is made of hardened, tempered steel, which gives precision-ground cutter edge durability. The cutter features high-impact polymer handles and knobs that are contoured and polished. Other features include a quick release cam-lock for easy blade removal. This hand plane seems like a solid choice if you want a cutter that adjusts easily for depth and alignment, so you always have precise control over the piece at hand. 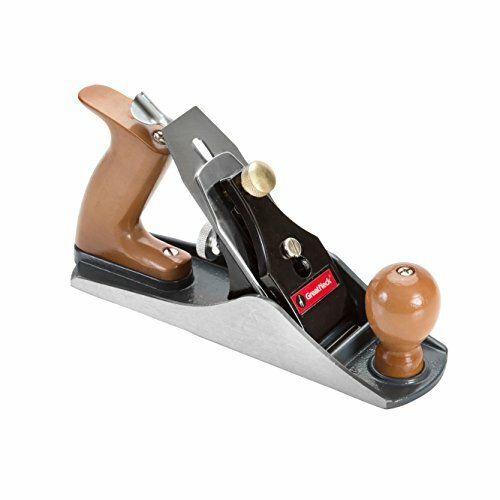 The general user consensus concerning the Stanley 12-404 Adjustable Bench Plane is that it is a great tool for a beginner. They praise its quality, sharpness, and sturdiness. However, buyers complain about several design flaws, namely: no chip breaker, knife control poorly located and too small, thin blade and no easy way to adjust the level or angle of the plane (plus, the blade constantly moves out of adjustment). If you are looking for a hand planer, you might want to consider the Grizzly 14’’ Smoothing Plane. Users love the usefulness of the tool, but some do complain about uneven sole and not sharp enough blade. This product is designed to be used for final finishing work. It features a perfectly flat sole that will smooth any wood surface. It also has rosewood handles and knobs, full plane iron adjustments, cast iron bases, frog and lever caps, chip breakers and knurled brass adjusting nuts. Its ground serrated sole improves sliding action by reducing resistance. This hand tool could be a solid choice if you want a tool which is beautifully made with precision fit and finish. In general, users have a favorable opinion of the Grizzly Smoothing Plane. They agree that it is a pretty good plane for the price, fairly made, comfortable in the hand and pretty heavy. However, some buyers complain about the sole not being flat and the blade not being sharp enough. One purchaser complains about the blade which is tightened with a screw and not a lever like the image shows. A very dissatisfied buyer complains about the adjustment mechanism which he couldn’t get to work no matter how hard he tried. The Great Neck Bench-Jack Plane is a solid option for a craftsman who needs a hand tool for both fine and coarse work. Users love the effectiveness of this plane, but some do complain about the quality. This product is a 9″ bench-jack plane with adjustable blades and a 2’’ steel cutter that may be resharpened. It has machined and polished body and a solid wood handle. This hand plane might be a solid choice if you want a tool for professional and heavy-duty application. In general, users have a favorable opinion of the Great Neck hand plane and they agree that it is a great tool for the price, if you set it up properly. They find it to be of great assistance and quite effective. However, purchasers warn not to expect the same quality as the high-end ones’. They complain about things like plastic handles and not-flat chip breaker. The Stanley Block Plane is a solid option if you are looking for total depth of cut and alignment adjustability. Users like the handiness of this hand plane, but some do complain about adjustment issues. This product is a cutter that features a grey, cast-iron base with precision-ground sides and bottom. The cutter rests at a 21° angle, which makes it ideal for cross-grain planing. Its quick-release lever cap and cam-lock make the cutter and iron removal easy. 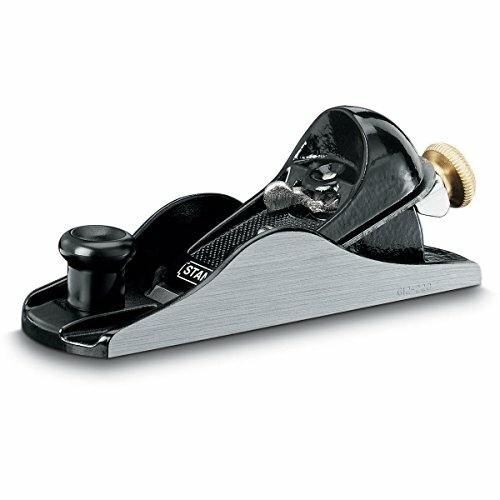 This item could be a solid choice if you are looking for a block plane with a finger-rest to add comfort and control. In general, buyers are pleased with the Stanley 12-220 Block Plane. They state that it holds an edge well once sharpened, feels heavy duty and works well. Users add that the plane is easy to use, adjust and hold. However, some buyers complain about the tool not holding an edge well. Some also complain about the machining of the iron adjustment slide being ineffective and rendering the tool useless. If you are looking for a top-rated hand plane, you might want to consider this one offered by Senkichi. Users love its performances and only one purchaser complains about wrong dimensions. This carpenter’s tool is a Japanese hand plane made of carbon steel. 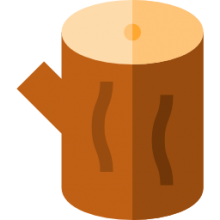 It is well suited for both reducing wood thickness, as well as smoothing. If you are looking for a general purpose plane for a novice, this might be a good option. In general, users are happy with the Senkichi Kanna 65mm. They like that it holds an edge for a long time and comes with a well-sharpened and honed blade. Users love the control they have pulling it and conclude it is of outstanding quality for the price. Only one buyer so far complains about the dimensions being completely off. A hand plane is a woodworking tool that utilizes brute force of the operator to pressurize the cutting blade of the plane to design and shape wood into the desired shape. There are some types of motor powered rotary power planers that are used for the same purpose, but for shaping larger pieces of wood. However, these larger hand options are not very suitable for precision planing. For more precise planing purposes, a miniature hand plane is more suitable. If a hand tool is powered by electricity and has the breadth of a wooden panel or board, then this larger hand planer can be referred to as a 'thickness planer', and is mainly used to finish, flatten or shape larger surfaces or boards. Typically speaking, all kinds of planes are mainly used to reduce the thickness of a rough piece of timber or lumber, as well as to flatten it and cut it in such a way that a smooth surface develops. Planers are also utilized to form vertical, horizontal or angled flat surfaces on pieces of wood that are too big to shape and sculpt accurately and where the requirement is to have a smooth surface across the entire large piece of wood. There are specially designed edging tools that are made in such a way that they are able to cut decorative moldings or joints. A typical hand example is usually a synthesis of various components, namely, a sharp cutting edge (like a sharpened metal plate) that is firmly connected to a hand grip or a handle. When this sharp cutting edge is moved over the surface of a wooden object, it tends to uniformly cut the top layer off as wood shavings. This is made more efficient by inclining the sharp cutting edge to put pressure on the wood, which makes it easy to render the surface of the wooden piece into a smooth and flat surface. The cutting edge can also protrude below the surface of the wood piece if you want to slice off shavings of wood from the bottom or sides. If you have a hand planer that has a large and flat sole, then you can guide the cutting edge in such a way that only the highest points of a wooden surface are shaved off, in such a way that after moving it back and forth a few times, the entire surface will be smooth and flat. When the main goal is to flatten the surface of a piece of wood, then using a bench planer is recommended as it has longer soles, which will make it easier to work with taller and longer pieces of wood. Having a longer sole means that a larger part of the wooden board's edge or surface is worked upon by the wood shaving tool, which will allow you to end up with a flatter and smoother edge or surface. On the other hand, if you use a smaller plane, you can retain a few high or low points if you don't want them to get flattened as well. Although the most common way of using them is to push it along a piece of wood while holding it with one or two hands, Japanese planes work differently from this. Japanese hand planes are not pushed away from the operator of the plane, instead, they are pulled towards the operator. There are a few pieces of equipment that have been developed to replace hand planers, such as a thickness planer or a jointer. Although these electrically powered devices can adequately perform the same functions as hand planers, you can save money and use one and your own skills at planing to do the same quality of work, as people have already been doing for centuries before the invention of these electrical woodworking gadgets. When a rough piece of lumber is taken and is shaped to specific dimensions, an electrically powered internal combustion engine or motor can be used to push a thickness planer along the piece of lumber to remove a fraction of extra wood in order to form a smooth and uniform surface on all four sides of the board. If you are using special types of wood, you can also use the planer to cut along the edges for more precision work.